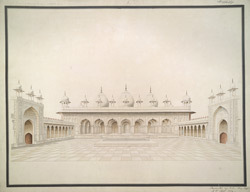 Watercolour of the Pearl Mosque (Moti Masjid) in Agra, by Latif, part of the Bax Collection, c. 1820-1822. Inscribed on the front in English: 'The Moota Musjid or Marble Mosque of Agra'; in Persian characters: 'Moti Masjid dar qil'ah i Akbarabad 'amal i Latif' (The Moti Masjid at the fort of Agra. The work of Latif).